Children need a certain amount of calories to grow and develop. But if a child takes in more calories than he or she uses, the body stores these extra calories as fat. In children who are otherwise healthy, weight gain most often happens because a child takes in more calories than he or she uses. As a parent you have a lot of influence on your child. Although you may not realize it, what you do affects the choices he or she makes. If your child sees you being physically active on a regular basis, he or she will be more likely to be active, too. Make physical activity part of your family’s normal routine. Find physical activities that you enjoy doing together as a family. The American Academy of Family Physicians (AAFP) recommends that all children participate in physical activity for at least an average of 30-60 minutes a day. The AAFP encourages parents and schools to make physical activity a priority. Prolonged periods of physical inactivity should also be discouraged in both the home and school. Good nutrition and regular physical activity can help your child achieve and maintain a healthy weight. 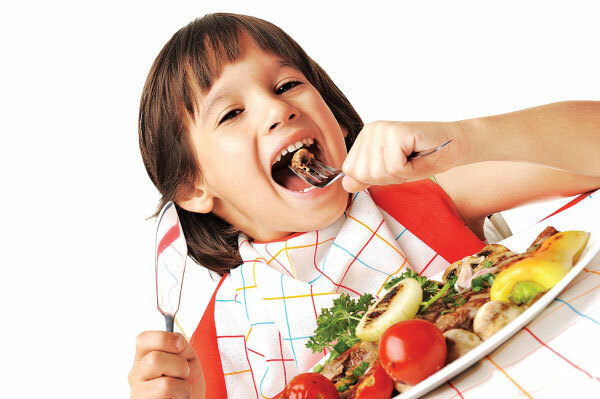 Teach your child good eating and exercise habits when he or she is young. Those good habits will continue to benefit your child as he or she grows into an adult. Staying fit helps prevent the health problems that being overweight or obese can cause later in life. *Be a good role model. *Choose healthy foods and snacks for yourself. *Have healthy snacks (for example, fruits like apples and bananas, and raw vegetables like carrots and celery) readily available in your home. *Teach your child how to make healthy choices for school lunches. *Avoid fast-food dining. If you do eat at a fast-food or sit-down restaurant, choose the healthiest options available. *Forget the “clean plate rule.” Let your child stop eating when he or she feels full. Limit your child’s screen time to no more than 1 to 2 hours a day. Screen time includes playing video or computer games, surfing the Internet, texting, and watching TV or DVDs. Set a good example by limiting your own screen time, too.